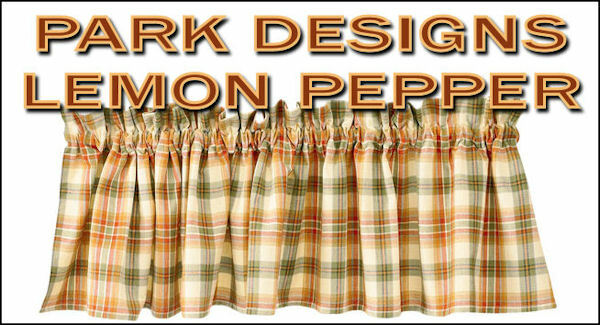 Park Designs Lemon Pepper is a pattern with rustic red, olive green, and mustard yellow plaid. An all time favorite. Lemon Pepper is available in a Placemat, Napkin, Tablecloths, Dishtowel, Table Runners, Potholder, Dishcloth, Rag Rugs, Panels, Lined Panels, Shower Curtain, Swag, Valance, Lined Layered Valance, Lined Fishtail Swag, Lined Button Pleat Valance, Tiers, and Chair Pad. Lemon Pepper is 100% cotton. Manufacturer recommends: machine wash, cold water, line dry, and touch up with iron if desired. For best results dry clean curtains to prevent shrinkage. 619-07 - LEMON PEPPER TABLECLOTH SIZE: 60" X 84"
619-12 - LEMON PEPPER RUNNER SIZE: 13" X 36"
619-13 - LEMON PEPPER RUNNER SIZE: 13" X 54"